Amidst expanding interest in local food and agriculture, food banks and allied organizations across the United States have increasingly engaged in diverse gleaning, gardening, and farming activities. Some of these programs reinforce food banks’ traditional role in distributing surplus commodities, and most extend food banks’ reliance on middle class volunteers and charitable donations. But some gleaning and especially gardening and farming programs seek to build poor people’s and communities’ capacity to meet more of their own food needs, signaling new roles for some food banks in promoting community food security and food justice. 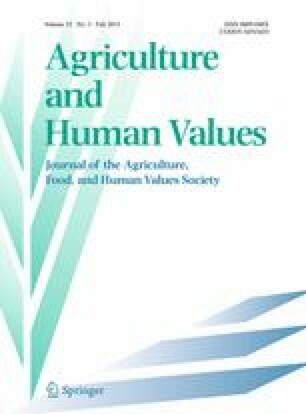 This article reports the results of a national survey and in-depth case studies of the ways in which food banks are engaging in and with local agriculture and how this influences food banks’ roles in community and regional food systems. The patterns it reveals reflect broader tensions in debates about hunger relief and food security. The research for this paper was funded by a pilot grant from the University of Pennsylvania’s Center for Public Health Initiatives (CPHI) and conducted in collaboration with the SHARE Food Program of Philadelphia. We wish to thank Steveanna Wynn at SHARE, Sheila Christopher at Hunger Free PA, Holly Beddome from the University of Manitoba, our colleagues in the CPHI, and especially the staff of food banks and partner organizations who hosted our site visits and interviews. Bratton, J. 2008. Food banks turn to gleaning in lean times. USA Today (July 22). http://www.usatoday.com/money/industries/food/2008-07-21-farmfood_N.htm. Accessed 20 June 2012. California Association of Food Banks. N.d. Farm to Family Out the Door: A Food Bank’s Guide to Produce Distribution in California. http://www.cafoodbanks.org/farm-family-out-door. Accessed 20 June 2012. California Association of Food Banks and California Department of Food and Agriculture. 2011. Utilizing New Methods of Crop Harvesting to Introduce Nutrient-Dense Specialty Crops to Low Income Consumers. http://www.cafoodbanks.org/utilizing-new-methods-of-crop-harvesting. Accessed 20 June 2012. Evans, S.H., and P. Clarke. 2011. Disseminating orphan innovations. Stanford Social Innovation Review 2. http://www.ssireview.org/articles/entry/disseminating_orphan_innovations. Accessed 10 June 2013. Harris, W. 2005. Banking on home grown goodness: Community gardens find a food bank niche. Kerr Center Field Notes (summer), 6–8. http://www.kerrcenter.com/nwsltr/2005/summer2005/community_gardens.htm. Accessed 20 June 2012. Santos, M. 2011. Bringing fresh produce to food banks. HealthyCal archive. www.healthycal.org/archives/3730. Accessed 28 May 2013. Weise, E. 2011. More food banks offer fresh fruits, vegetables. USA Today (January 31). http://www.usatoday.com/money/industries/food/2011-01-31-foodbank31_ST_N.htm. Accessed 20 June 2012. Winne, M. 2007. The futility of food banks. Washington Post (November 19). http://www.washingtonpost.com/wp-dyn/content/discussion/2007/11/16/DI2007111601442.html. Accessed 20 June 2012.